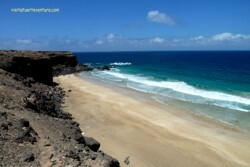 Eagle Beach (or the beach Stairs) (which has the second name from the steep stairs that must travel down to the beach), is located south of the "Grande" Beach of El Cotillo (stone beach). To reach this beautiful beach, we have to follow the dirt road that leaves the castle Toston (south of El Cotillo), which is on the south coast. About 4 miles arrive at the beach which is easily recognizable because it is lowering some steep stairs. At this beach you have to go with low tide as at high tide, the beach is very narrow, so it loses much of its charm. It has no services, so please bring food or drink. It is never crowded, so it becomes the perfect choice if you want to unwind and enjoy a wilderness. Excellent beach at low tide, always empty of people, and perfect to give you some good rides. is a great unknown in Fuerteventura. Beware of the sea if you bathe in the beach. Parking: 10 metros to the beach.